Our good friend Rick Lee passed away August 27, 2014 after a lengthy illness. Rick was many things. As a musician, he was a singer with a warm, deep voice, an accomplished pianist and banjoist, a skilled songwriter and performer, a master jammer, and a consummate song collector, folk music archivist and scholar. His music and his many recordings are enjoyed and respected all over the world. Rick is also well-loved for his support and encouragement of other musicians of all ages over the span of more than 50 years. He will be deeply missed by those whose lives he touched – in the folk and traditional music community and well beyond. Rick also held a PhD in psychology from Harvard. He traveled the world leading workshops on mediation. 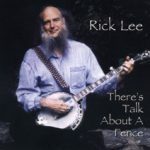 Rick Lee was a Massachusetts-based old-time banjo and piano player, singer and songwriter whose family roots were deep in Tennessee. He was a part of the New England music scene for more than fifty years. His Tennessee-born grandfather was a singer with a repertoire from the mountains of eastern Tennessee, and Rick’s early repertoire included southern mountain, and Scots and Irish ballads and tunes. Through the years, Rick became known for his dedication to finding wonderful songs from diverse sources and bringing them together seamlessly to form a rich tapestry of varying moods, colors and textures in his live shows and his recordings. His material ranges from songs that are of another time to songs that speak of the idiosyncrasies and beauty of modern life, from the profound to the comical, and includes a sprinkling of his signature banjo and piano instrumentals. His love of the song shows through not only in his treatment of the songs he performed, but in the marvelous, in-depth liner notes he provided with each recording. These notes allow the listener to reach a deeper level of understanding and appreciation of the evolution and history behind the traditional songs Rick recorded, and to get a glimpse into what makes songwriters tick. Of course, if you just want to listen, all you have to do is press “play”, close your eyes, and let Rick take you on a musical voyage.